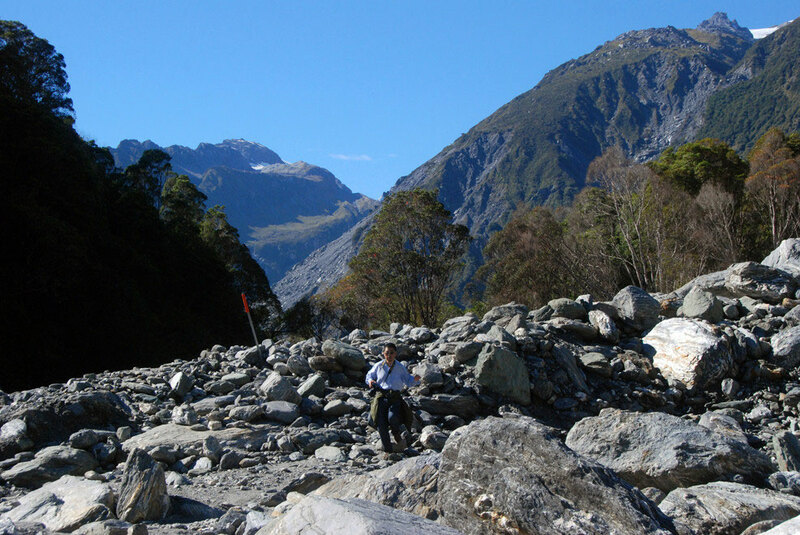 Looking up the lower Fox Glacier valley to the site of the once large terminal moraine subsequently eroded. 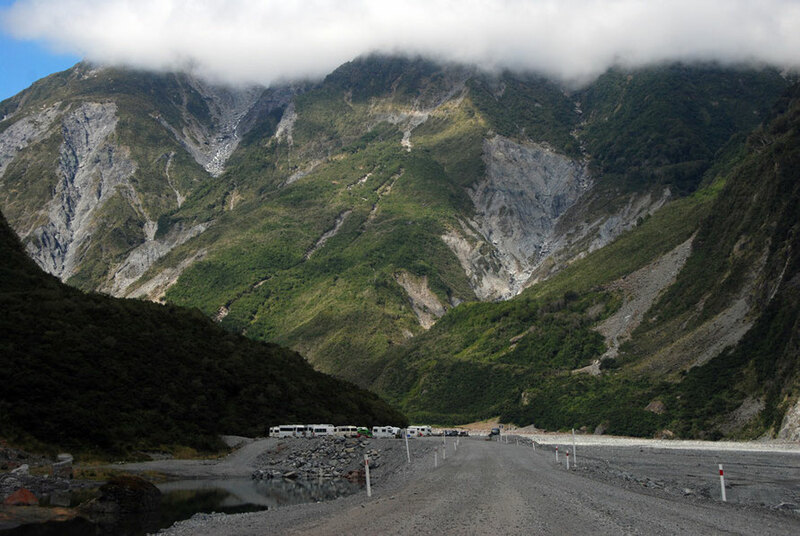 The remnant forms the car park for the path to the glacier terminus. 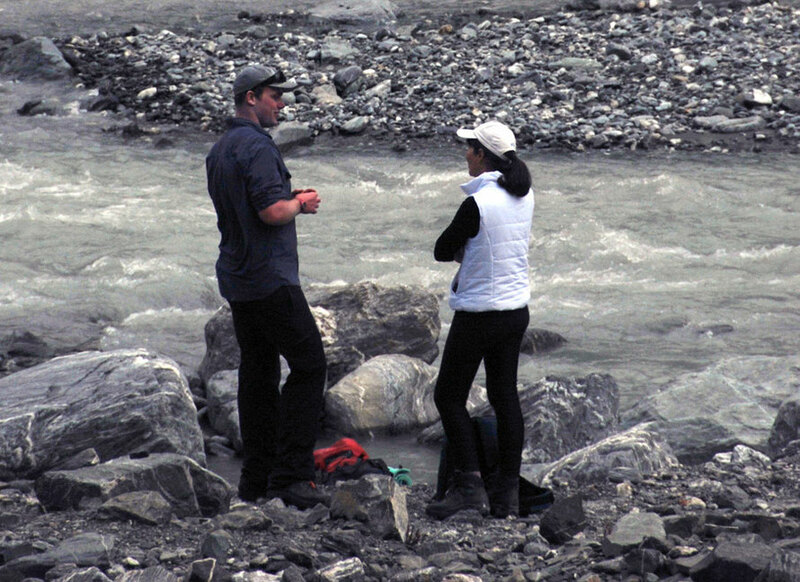 There are certain places on almost any travel where bumping into other traveller's is unavoidable and even refreshing. 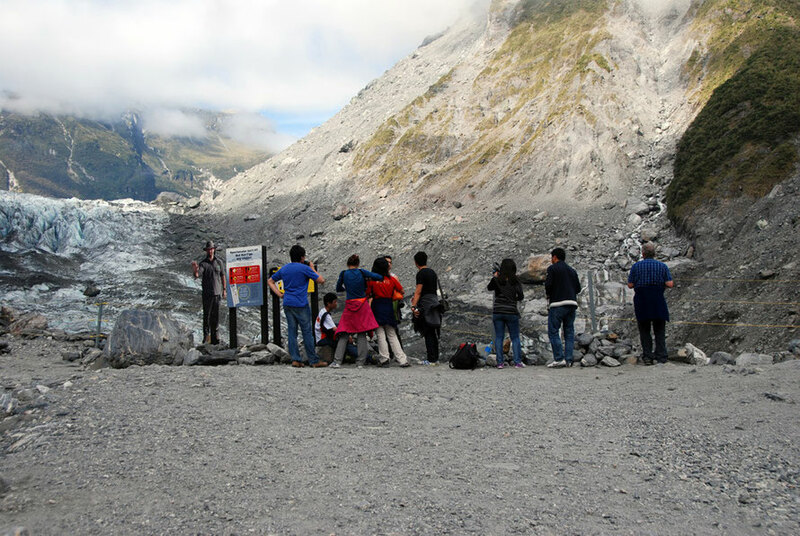 Fox Glacier is one of those places. Here there is a sense of shared adventure and maybe the sheer awesome scale of the valley, the destruction wrought within it and the many signs warning of hazards from rockfalls ('Don't stop') to ice collapses and surge waves makes one feel a little better disposed to the rest of humanity. The excellent 'full Fox breakfast' in a nice cafe in Fox Village also helped. 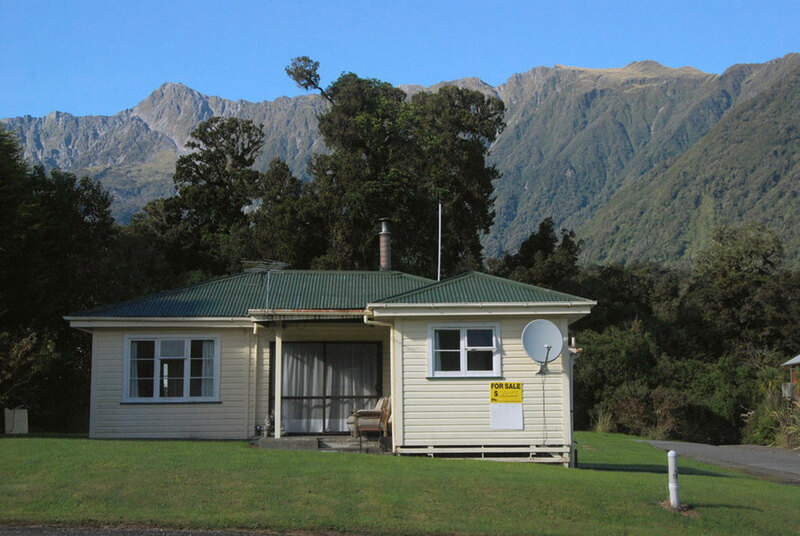 The Fox and Franz Josef are veritable 'engine rooms' of South Island and New Zealand tourism attracting some 400,000 visitors a year. (Westland Tai Poutini National Park Management Plan 2001-11 pp. 49-50). We met the charming Department of Conservation ranger (above) on the Chalet Lookout Path. He'd been called out with his spade by his HQ to identify a bad smell on the path. Apparently someone had complained. Priding myself on my sense of smell I immediately began sniffing around like a spaniel on heat. The ranger-guy reckoned a Chamois or a Himalayan Tahr had probably got itself killed down in the boulder field that went under the name of Mill Creek. Both Chamois and Tahr (along with red deer) were introduced in the 19th century to stock the mammal-free New Zealand mountains with game: a decision that has been regretted pretty much ever since (see here for the bizarre-looking Tahr under the DOC's A-Z of 'pests'). We fell to chatting about this and that as the sun shone and a merry brook babbled through the bush beside us. 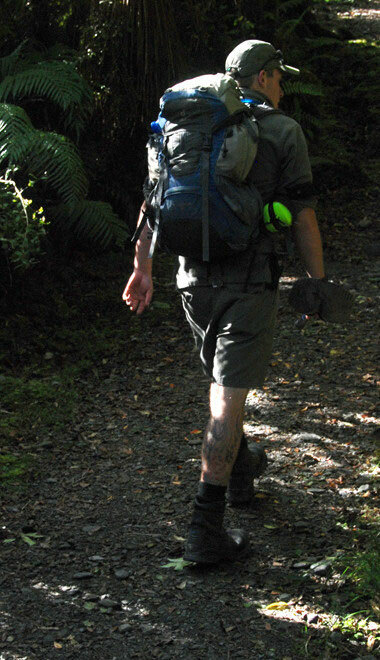 He was off to climb Aoraki/Mt Cook in the future. They hitch rides on choppers up above the snow line and practice ice climbing. He found the sandflies a menace. Particularly down on the coast. If a chopper was bringing in materials at Gillespies Beach (see previous page) he'd sit out the wait in his jeep however hot rather than risk being eaten alive. 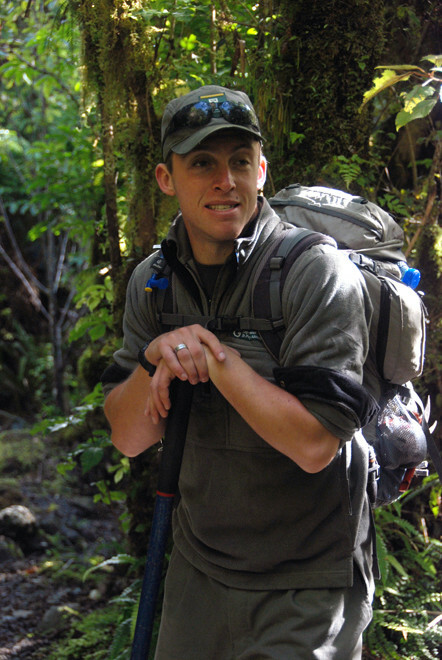 His ranger mates reckoned that as a newbie from Auckland he not only got bitten more but also attracted the sandflies to his mates. The job was in a spin. He loved the work and he looked great in his ranger's kit. But the whole team were having to reapply for their posts and the posts had been chopped. We wished him luck on that one. A cruel passage for anyone to face. 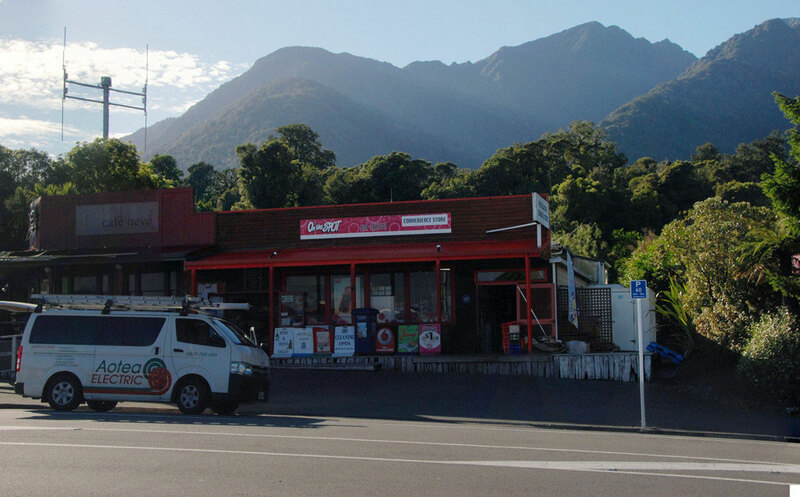 We got on to the recent kidnap of the women tourists on the West Coast (for details see To Authur's Pass). The whole drama had played on the empty National Highway 6 that runs south of Fox to Haast and Wanaka. 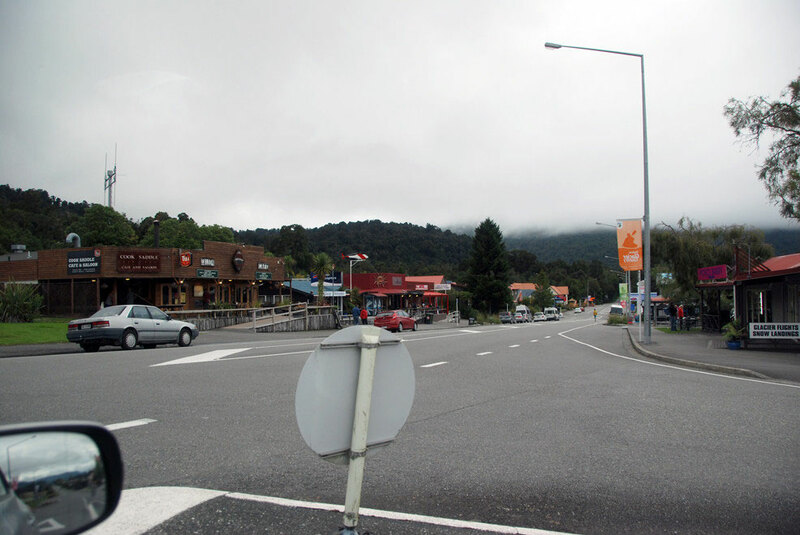 The young women had been picked up in Whataroa, north of Fox. One had managed to leap out of the Nissan Terrano and eventually both had escaped the driver. The alarm was raised an he was pinned between two roadblocks on the two lane highway. A standoff took place over five hours as the kidnapper drove up and down the section of highway between the cops. Reinforcements and armed police were flow in from 'over the hill' in Christchurch. It had been a busy day for the ranger service. Talked turned back to the smell and our ranger mate reckoning he'd finish the day one way or the other with wet boots (again). There was a lot more but it's all escaped with the passage of time. We said our goodbyes and wished him luck with the smell. I kept sniffing expectantly but to no avail. Later he passed us on his way back down the path the smell undiscovered. I told him I'd keep a look out and let them know at the office in Fox if I came across anything. Which I didn't. He had such a broad open grin and with all that clobber on it was kind of hard not to like him. 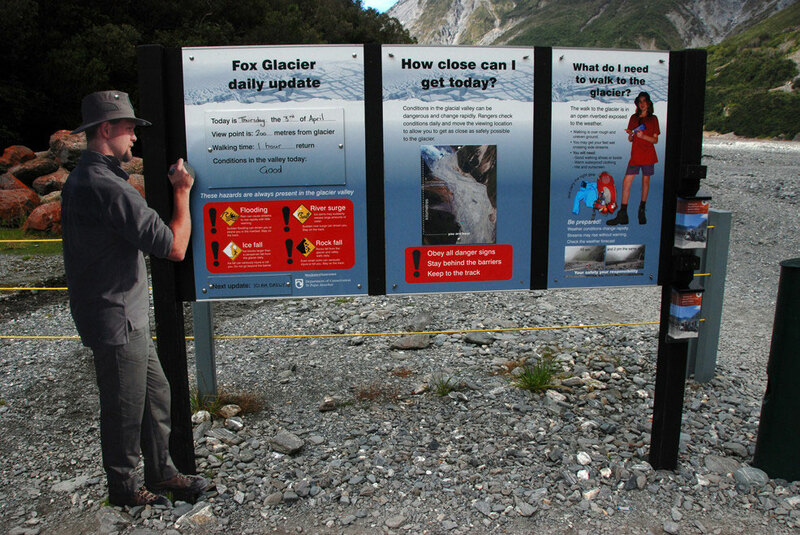 I hope he got his job back and that he continues to work the Fox Glacier. Trying to follow the path at Mills Creek on the Chalet Lookout route. We clambered on up the Chalet Path to the lookout and the concrete basement of the 'chalet' that had once served as a 'luncheon hut' during the early days of glacier walks. The lookout itself is a little raised deck area surrounded by bush. It was occupied with two non-communicative Germans who were hopefully wrapped up in the wonder of the place and munching ridiculously healthy looking German snacks. I got on with trying to break the world record for out-of-focus photos of a distant glacier. They eventually left and I began to wonder where 'The Principal' had gotten to. Time ticked away and I had the place to myself but I knew something was wrong. Eventually I heard my name being called though the bush. 'The Principal' had taken a wrong turn at Mills Creek and for some reason headed up stream in the chaos of the boulder bed. I was straggling way behind taking any number of photos of ferns and mosses and somehow we missed each other when I crossed the creek (easy to do as there is no marked path but a just a series of well-spaced-out red marker sticks). Then approaching the Lookout 'The Principal' had encountered the warning signs and yellow tape for the recent flood and rockfall. Luckily she didn't head down this and on hearing my name I called back and we were re-united on the raised decking to drink in the sights and birdsong around us. 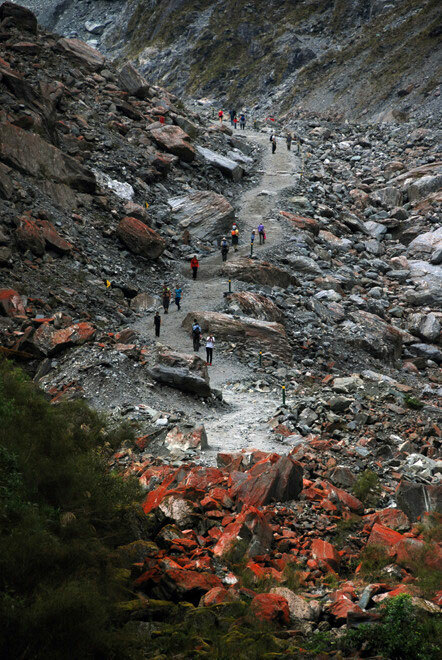 The path to the glacier terminus was much more peopled, crowded even. There were all sorts there. Middle-aged Brit couples we'd spied in the restaurant the night before, many Chinese in amazingly bright coloured outfits, and healthy looking North Europeans in stalwart shorts and minimal tops. Apropos of this we had met a lovely German couple at Milford Sound and enjoyed an on-board meal with them on our half day cruise. They both wore short shorts and as we waited to embark on the boat the sandflies feasted on their taught flesh. I had my long trousers tucked into my socks. At the glacier lookout there was much hilarity as we got chatting to an elderly but spry New Zealand couple. He was a no-nonsense sort of guy and wasn't taking all the barriers and warnings laying down. He'd been coming to the glacier for at least a thousand years and no bits of rope were going to restrict his free movement. 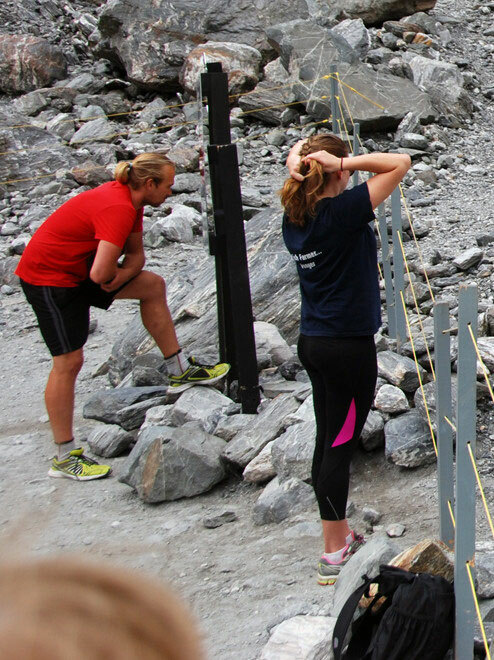 So he nimbly popped over three-strand rope fence and perched himself on the precipice above the terminus. 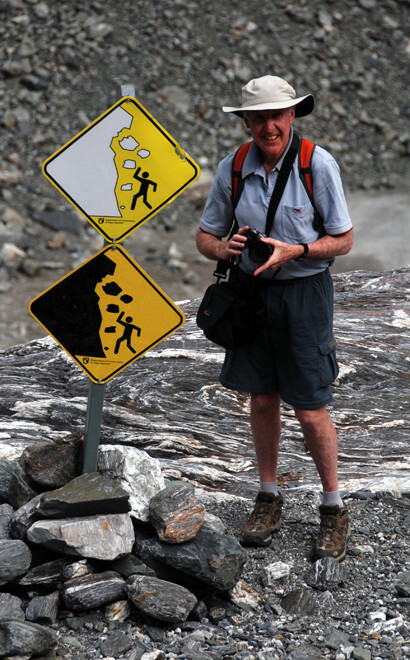 I took a picture of him gamely standing by signs for both rock-falls and ice-falls. 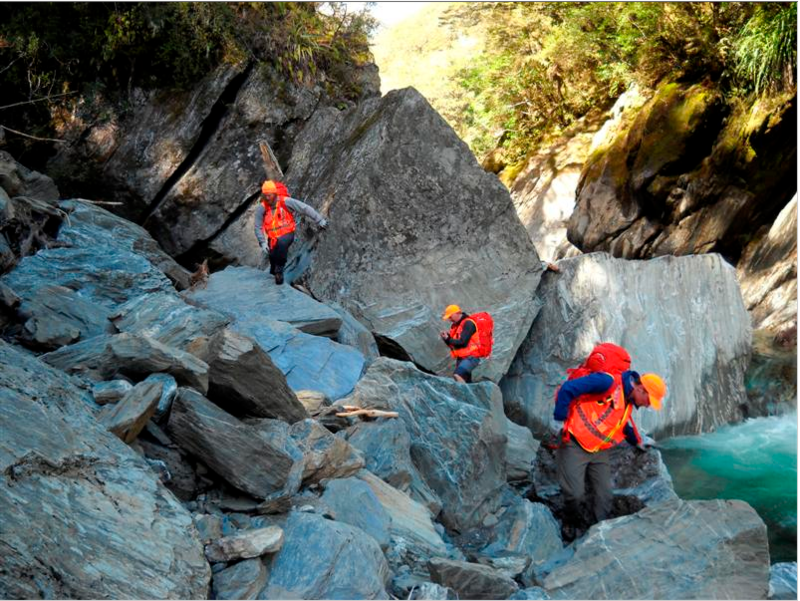 The Augean Stable Job: the boulder shifting team on a high later moraine near the Fox Glacier terminus. 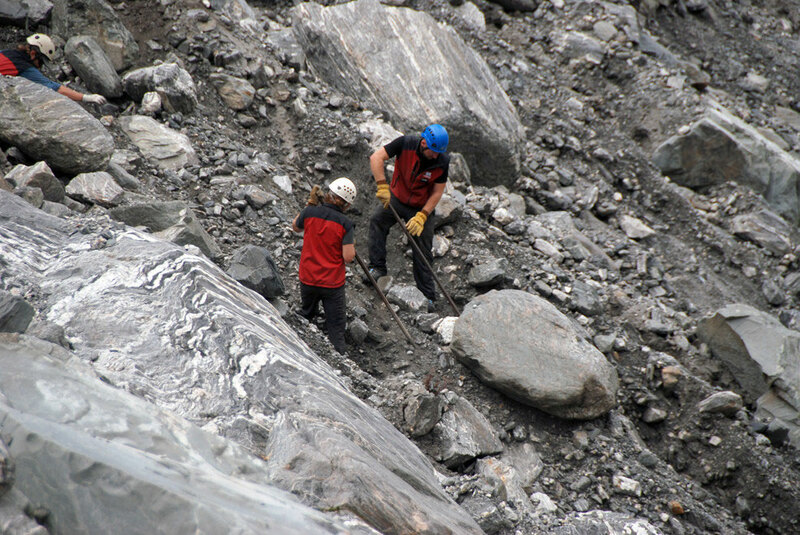 Note the height of the shoulder beyond the team scoured out by a much bigger glacier than the present Fox. The cause of our faux outrage was not so much the rope barriers and signs but the group of men and one woman sitting the other side of it in helmets and red jerkins. We wondered what gave them the right to be there in this country of equals where 'tall poppies' were soon cut down to size. It turned out that they were on a mission. Now quite what that mission was eluded all of us. With long steel crowbars, hardhats and sturdy work gloves they looked as if they were doing the Fox Glacier equivalent of cleaning those stables in far away, mythical Greece. It's Augean I later checked. From King Augeus. 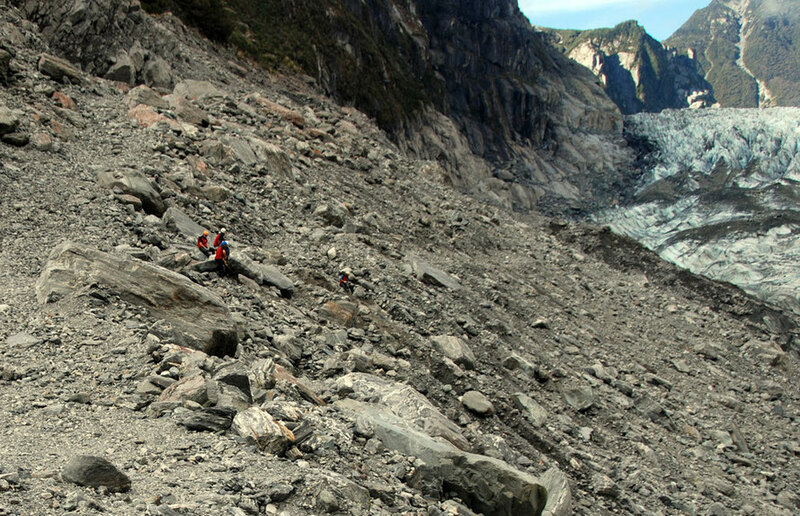 But the guys out in front of us were lost in the enormity of the Fox glacier's high terminal moraines. It seemed an impossible task and one us watchers did not really understand. 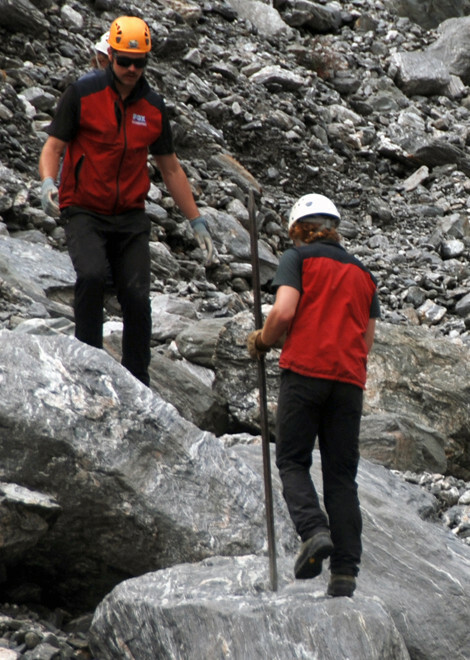 With what looked like scant knowledge of Health and Safety the team took to levering boulders down the precipitous slope with brute force. It wasn't easy. There's a lot of things you can do with an eight foot steel bar but levelling a huge glacial moraine is not one of them. I've had a look around on the web but can find nothing about this activity. But that is the internet for you. 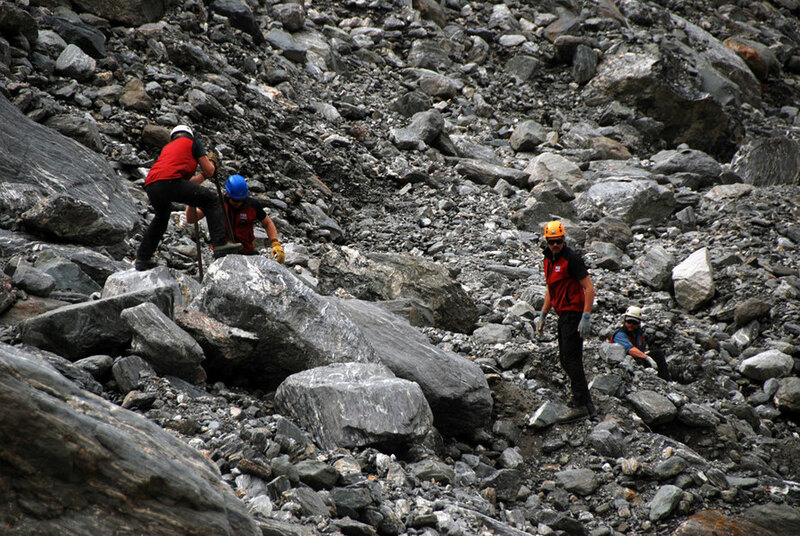 Punch in 'Fox Glacier Boulder Shifting' and you'll get lots of tourist sights and press stories about boulders killing people, like the two Canadians in a camper-van on the Haast Pass in 2013. Anyway, the jerkins the guys were wearing clearly said 'Fox' and one even appears to say 'Adam'. Maybe his name was 'Adam Fox'? My guess is that this team was trying to forestall rockfalls falling onto people visiting the glacier but but more than that I cannot tell. If anyone knows please let me know! 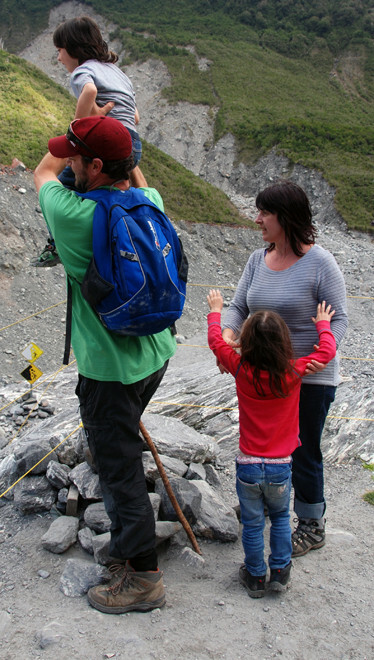 'Who gives a schist? ', as they say up on the moraines of the Fox Glacier. She followed the shearing season across Australia, New Zealand and Scotland. She said the wages in New Zealand were the worst and that she couldn’t live on them long-term. 'A girl has certain requirements', she said. We had met the guys (below) on the road between Haast and Fox Village as the light was fading. They were looking like us for somewhere to stop for the night in their camper. They'd pulled off a little way back and had got distinct 'Deliverance' style vibes and were racing the falling dark to find somewhere better. They did. From Brighton in the UK they were seriously thinking of upping sticks and emigrating to New Zealand. They were eking out their funds to stay on the road as long as possible and were having a great time. The end of the line: the lookout over the Fox Glacier. 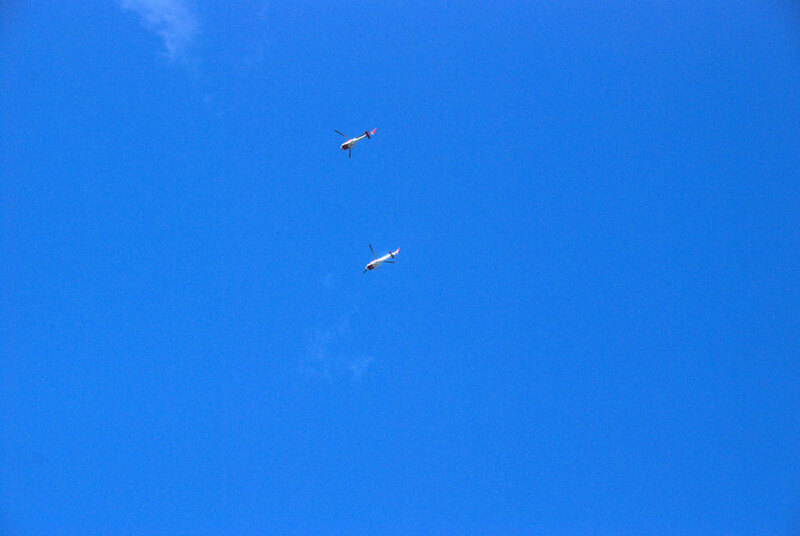 Helicopters stand by to whisk explorers for their five minutes on the glacier at vast cost. 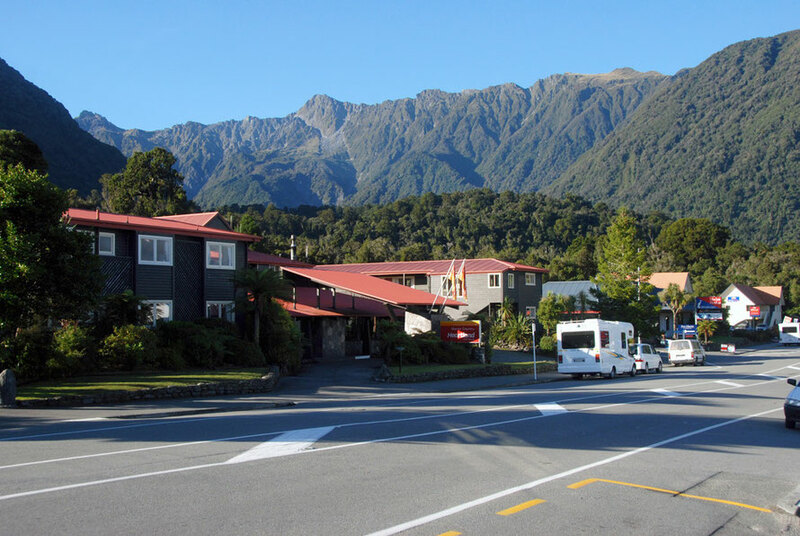 The magnificent backdrop to Fox Glacier Village. The population of Fox Village has increase from 117 to 375 in 5 years. The main drag, Fox Glacier Village. 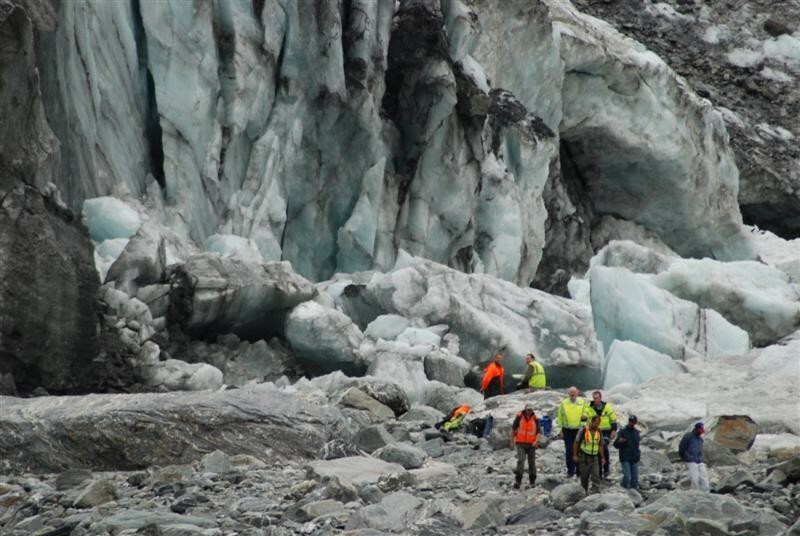 Guides and police at Fox Glacier with family members of the two Australian brothers killed underneath the Fox Glacier by hundreds of tons of falling ice in 2009 (Click for link).